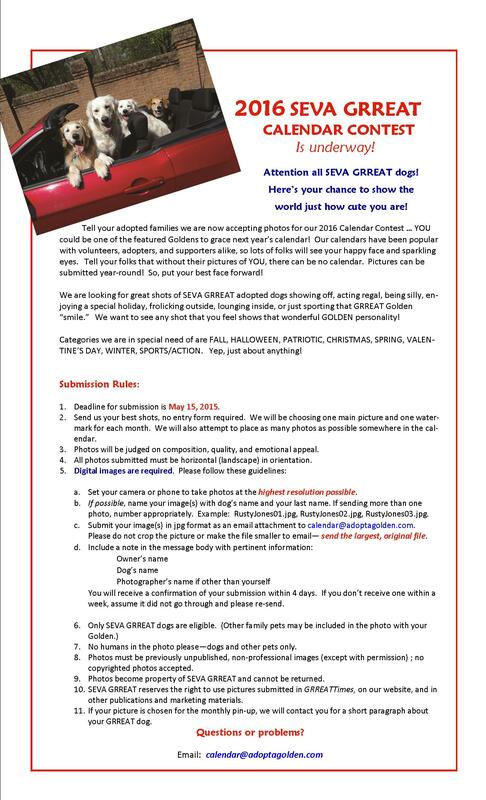 We need pictures for the 2016 Calendar! Without your wonderful photos, there can be no calendar! Hey, all you beautiful Goldens, DON’T BE LAZY! Get your human companions to keep their cameras on hand for all the cute moments you provide. YOU, TOO, could be in the 2016 Calendar! We are in dire need of seasonal pictures to fill our empty calendar. Last year we had to beg for fall and Halloween pics. We did get a couple of really GRREAT ones but I know there are more out there to be discovered. 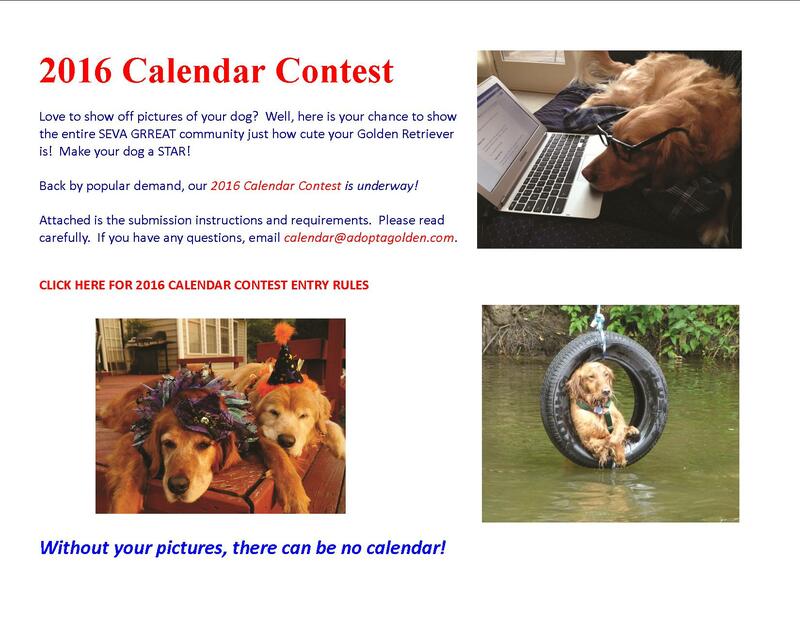 You may now submit your pictures year-round at calendar@adoptagolden.com. Send them as you take them. We are at work 24/7. If you don’t have your 2015 Calendar yet, look for it at one of our upcoming events or order it on line at http://www.adoptagolden.com. Thanks for your continued support of our beloved dogs. 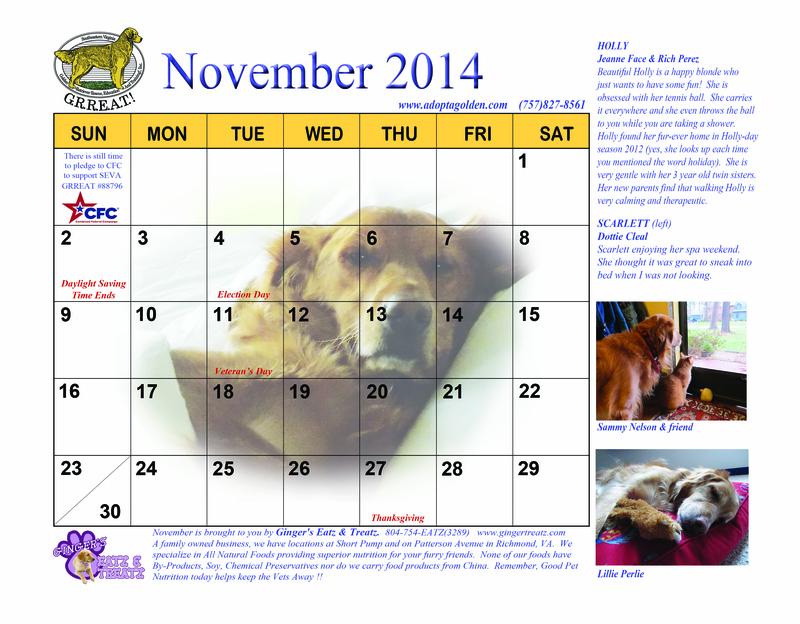 Learn more about becoming involved with SEVA GRREAT and meet some adoptable Goldens. Plus, get your SEVA GRREAT 2015 Calendars and merchandise in plenty of time for the holidays! The 15th Annual Pet Expo is a unique indoor event where you can bring your pet to enjoy a day of fun and excitement with the whole family! Over 75 exhibitors that sell animal-related goods and services will be on hand, plus many animal rescue groups. Activities are scheduled throughout the day, many of which you can do with your pet! Come visit SEVA GRREAT again this fall for a fun event. Dress your pet in his or her favorite “Howl’oween” costume, enter them in a contest, and enjoy vendors and entertainment sure to delight all pets and their owners. We hope to have many of our Goldens and their humans there to help spread the word about SEVA GRREAT. Join us for a new event to have fun, share the word about SEVA GRREAT, and help adoptable Goldens. While this location may be a bit outside our “typical” coverage area, it’s a great opportunity to help more Goldens in need. Come join us with your pups if you can. 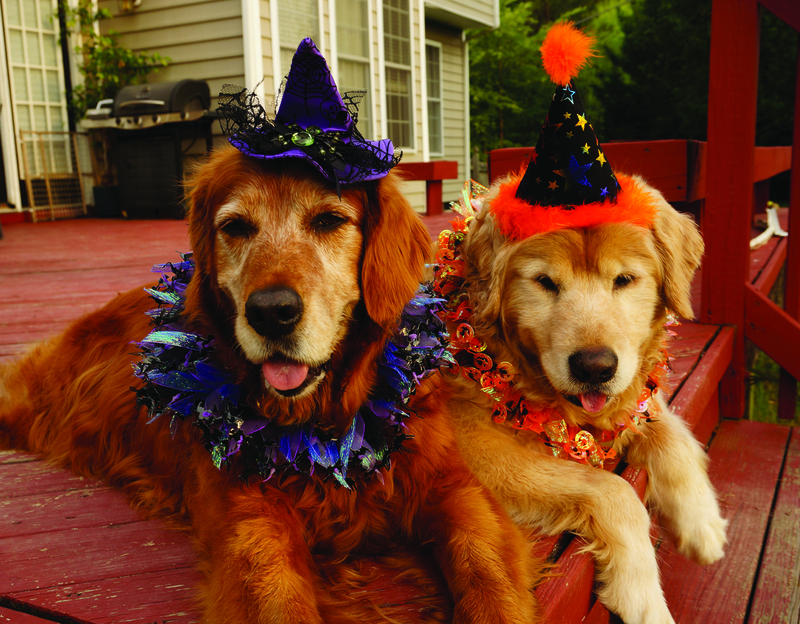 And be sure to have your pup dressed in their Halloween best for the costume contest!! Yappy Hours! Every Sunday Keswick Vineyards is a big supporter of rescuing animals (we have 16 rescued dogs and cats of our own!) and so Yappy Hours is a weekly event, in which we invite local animal shelters to visit and bring their furry friends that are in need of homes. Everyone is invited to come out and bring their own furry friends and enjoy the company of all, with the end goal being to find some homes for these animals in need. For every bottle opened during Yappy Hours Keswick Vineyards donates a dollar to the visiting animal rescue shelter! Looking for something to do this dreary day? IT’S NOT TOO LATE to go to the CRAFT BEER FESTIVAL!! Are you just sitting around watching TV and bored to tears? Time’s a-wasting! Jump in the car and head to the VIRGINIA CRAFT BEER FESTIVAL before they run out of beer! Thanks to our GRREAT friends at DoG Street Pub, SEVA GRREAT has been chosen as one of the rescues to benefit from the festivities at the Virginia Craft Beer Festival. You still have time to get there. WHERE? Merchants Square in Williamsburg. It started a little while ago but if you hurry (but don’t go any faster than your guardian angel can fly!) you can still make it. Oh, make sure you have a designated driver to come back home. AND, you can be among the first to see the NEW 2016 CALENDAR! It has been brought to our attention that the dates in November were one day off. The attached file has been corrected. We are sorry for any inconvenience. BISSELL Christmas in July Giveaway! Did you know that the BISSELL Pet Foundation is bringing you Christmas in July? Starting today through July 13th, we will give away a BISSELL product to one of our fans. Daily winners will be able to choose their favorite Partners for Pets members to receive a $1,000 gift from the BISSELL Pet Foundation. Share this with your friends, volunteers and supporters! Make sure they “like” the BISSELL Pet Foundation Facebook page and comment every day! You might be the lucky winner and receive $1,000! Well, the 2015 Calendar has gone to press! We are now collecting pictures for the 2016 Calendar! 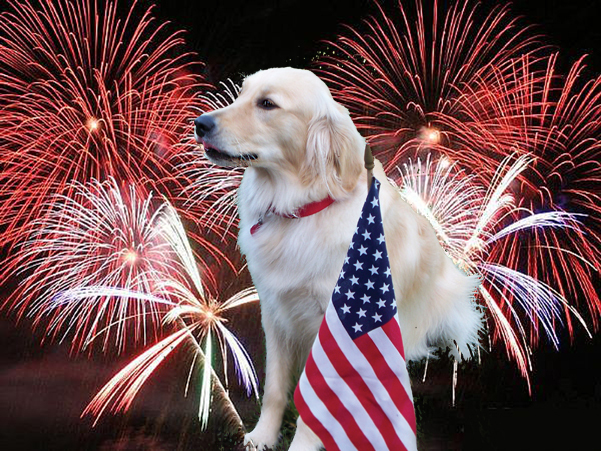 Get creative this holiday weekend and take or create a great patriotic picture of your rescued Golden. Rules remain the same as in the past. Please include your dog’s name in the subject line and email the highest resolution landscape formatted picture to calendar@adoptagolden.com. Please include the owner’s names, who took the photograph if other than yourself, and a brief story about your dog. And, while I have your attention, let’s wish PJ (above) a happy birthday! Pampered Chef On-Line Fundraiser in Progress! SEVA-GRREAT is having an ONLINE Pampered Chef Fundraiser! 10-15% of your purchase will be donated to them! Pampered Chef products make cooking and entertaining a breeze!